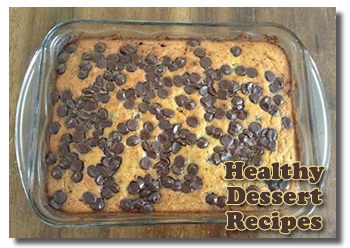 A healthy dessert recipe can taste just as yummy as a naughty one! With a few swaps you can create some old favorites with healthier ingredients and no one will know the difference. Here at Chocolate Candy Mall, we have a LOT of naughty recipes. I love their sweet gooey goodness, whether they are chocolate based desserts or not. However, the older I get, the more I appreciate the importance of being a bit more sensible when it comes to a healthy diet. Cutting back on sugar intake is a great place to start, but there are other substitutions that can be made to turn less healthy treats into healthier options. In fact, it's about time we start a Healthy Dessert Recipe Collection. I'm adding a form down below where YOU can submit YOUR own favorite healthy recipes for desserts. I especially look forward to your ideas for healthy chocolate desserts. I don't bake desserts very often but I am today. She doesn't have to eat healthy, but I do, and I want to enjoy cake with her, so I am making it with coconut flour, coconut sugar, and coconut cream. Blend together everything except the flour, baking powder, and chocolate chips to make a wet batter. Combine the coconut flour with baking powder, then whisk into the wet batter until there are no lumps. Fold 1/2 cup of chocolate chips into the batter. Pour batter into a greased 11 x 7 x 2 inch or 9 x 9 x 2 inch pan. Sprinkle the remaining chocolate chips evenly over the top of the batter; they will sink into the cake while cooking. Bake at 350 degrees F (175 C) for 40 - 45 minutes or until knife inserted in center comes out clean. Cool and frost. This recipe is from the book, Cooking With Coconut Flour by Bruce Fife. Share Your Favorite Recipes For Healthy Desserts! 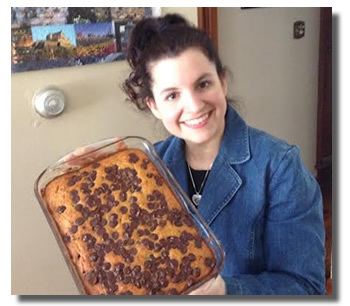 Do you have a dessert recipe that you enjoy "guilt free?" Add it to our Recipe Collection of Healthy Desserts.